For those looking for a versatile design and affordability, this review of the Snoozer Wheel Around 4-In-1 Pet Carrier should undoubtedly be of interest. Approved by many airlines, this product can be used as a backpack, car seat carrier, pet bed, and has an extendable handle and wheels for easy transportation. 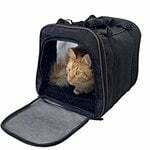 For the pet owner who wants to keep their options open, this is a useful pet travel carrier that can be used in a wide range of situations. Made for small dog breeds and cats, the open mesh design gives a lot of ventilation. If you need to wheel your pet around, the telescopic handle can be extended to different lengths to suit. It’s been crash tested for use in cars and has been found to be safe. As a pet bed, it provides a comfortable den for any small dog whether you’re traveling or at home. Our review of the Snoozer Wheel Around 4-in-1 Pet Carrier will take a look at what you can do with this product, who it’s for and what customers are saying about it. We’ll examine the good and the bad points so that you can make an informed decision on whether this is the right carrier for you. If you don’t have much time to read the whole review, click on the link below to buy it now, check customer reviews, and find out the latest pricing information. CLICK HERE to Check Out the Pricing for the Snoozer Wheel Around 4-In-1 Pet Travel Carrier on Amazon! 1.2 What Are the Available Sizes and Colors? 1.3 What Are the Advantages and Disadvantages? 1.4 Who is Buying It? 1.6 Should I Buy It? Soft-sided carriers can be good for one thing but not for others. While 4-in-1 Pet Carrier fits into this category, it’s still a fairly sturdy travel carrier and provides a comfortable place to keep your dog or cat. Most people will be looking at the flexibility of the Snoozer travel carrier when they are considering whether to buy. It’s one of the big selling points for this product. For those who spend a lot of time traveling, the Snoozer could well be the pet carrier you’ve been looking for. With the extendable handle and wheelbase, it’s useful for boarding at airlines while keeping your pet comfortable. The soft mesh canopy is also suitable for fitting under most cabin seats. When you’re using the Snoozer Travel Carrier in the car, it’s simple to secure it on any passenger seat. Unusually, it’s been tested extensively to ensure this is safe for your dog. Should you need to stop overnight or are camping out, the carrier can quickly be converted into a small, cozy kennel. For those who like to take their dog out on the street or for hikes in the wilderness, this product also converts into a great backpack. It rests comfortably over the shoulders and gives your pooch a clear, all-round view of the world. Based in South Carolina, Snoozer is a small but innovative pet product company producing a wide range of beds, carriers, and seats. Their primary market is for dogs and cats, but their carriers have been used for other pets over the years. The company backs up high-quality and durable products with an excellent customer ethos that buyers appreciate. What Are the Available Sizes and Colors? The great news is that the versatile Snoozer Pet Carrier comes in two different sizes: Medium and large. Medium: 20″ x 14″ x 11″ suitable for pets up to 15 lbs. Large: 23” x 15.5” x 12.25” suitable for pets up to 30 lbs. There are three colors available: Red, khaki, and black. CLICK HERE to Buy the Snoozer Wheel Around Pet Carrier on Amazon! The trouble with a product that says it does four jobs in one is that it often doesn’t do them well enough. The Snoozer Wheel Around 4-in-1 Pet Travel Carrier has excellent reviews that suggest it defies all expectations. Simple to use and easy to switch from one mode to the next, many customers buy the carrier because it fits a range of pet transportation needs. 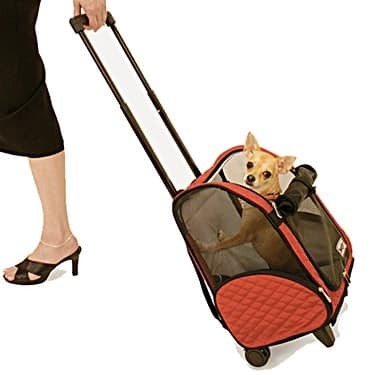 If you’re a regular traveler on flights and need to take your dog or cat with you, for instance, it’s a pet carrier approved by internal airlines. The flexibility of the build means it also fits under most cabin seats. As with any pet carrier, the measurements provided are external, so you need to compensate to pick the right size for your dog or cat. While the larger version says you, it will take pets up to 30 lbs. a lot, of course, depends on the shape and size of your dog. This is a great option for road travelers too. 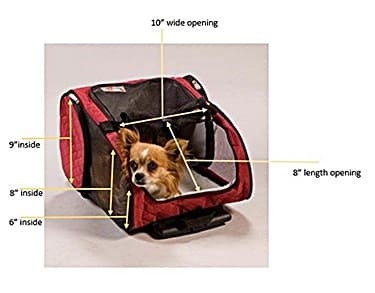 You can easily secure the carrier with a seatbelt, and when you get to your destination, it can be removed and opened up to form a nice den or kennel. It’s also a good carrier for transporting your animal to and from the vets. This is a pet carrier that gives you plenty of flexibility. It has been crash-tested for use in cars, so your pet gets the protection it needs while you are on the road. There’s plenty of ventilation on three sides of the Snoozer carrier. You can quickly convert it into a trolley, backpack, car seat or home kennel. It’s easy to clean and made from microfiber that is soft and flexible. As a backpack, it’s comfortable with padded straps. The padded bottom provides your pet with extra comfort, and the base can easily be removed for cleaning. Pockets allow you to store treats and toys for your pet. It comes with an interior clip that you can fasten to a harness to keep your pet secure. If you are trying to fit under an airline seat, you may need to remove the bottom padding which can be an inconvenience. The wheels for using as a trolley can get clogged easily with dirt if you use it outside. Slightly more expensive than other carriers but it does have the advantage of you using it in a wider range of circumstances. For those expecting to travel by airline, it always makes sense to check beforehand whether your carrier is suitable or not, to be on the safe side. Picking a window or middle seat on the flight will ensure that you have enough room underneath to fit your carrier. Some pet owners opt for different carriers to meet different circumstances. For instance, if you have a small dog, you may own both a pooch pouch or backpack and traditional carrier. This product from Snoozer gives you a 4-in-1 option that means it’s the only one you need to buy. A lot will depend on the type of dog you have. It’s perfect for smaller breeds such as chihuahuas and other pets such as cats. Medium size dogs are suitable for the larger model, but you should always check beforehand that they are going to fit comfortably. The reviews, in general, have been positive for the Snoozer Travel Carrier. It’s the kind of product that appeals to a wide range of different pet owners, and the flexibility is key to its success compared to others on the market. Here are just some of the things that customers have been saying about the 4-in-1 Pet Travel Carrier. A lot of the customers who purchased this product do so with the intention of using on an internal US flight. The good news is that most of them had no problems either at check-in or during the flight. Some had to remove the bottom padding once they got on board, but this wasn’t a major issue. Even the large model fits comfortably under most seats. Customers who travel by boat, train and car have said that this is a great all round carrier that is suitable for just about anything. Small dog owners often need something like a backpack carrier if they are out hiking in the country. Unfortunately, Chihuahuas and Shih Tzus tend to get tired a lot more easily, especially over long distances. Having a backpack like this that can then double as a small kennel, so it is perfect, according to customers, for camping trips. Cat owners are also rating this product highly for its flexibility and durability. Cats can be a lot fussier than dogs, so finding a suitable carrier is a lot more difficult. The fact that you can use this is as a kennel/hut means that cats have more time to get used to it. There is an interior clip for attaching to a harness, but customers suggest only using this when you have the carrier open. That’s because your pet can get tangled up and you should be monitoring them if using. This is the sort of pet travel carrier that provides most everything that you need. 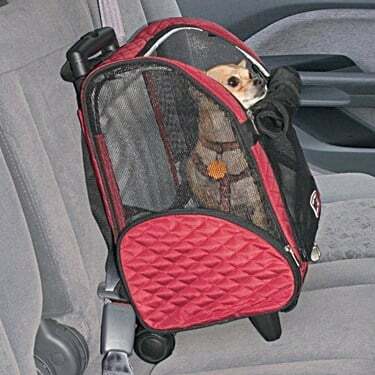 According to customer reviews, it suits small to medium size dogs and cats and is ideal for airline and other travel. If you have been looking for a catch-all solution to your pet transportation needs, the Snoozer Wheel Around 4-in-1 Pet Travel Carrier is well worth a closer examination. CLICK HERE to Buy the Snoozer Wheel Around 4-In-1 Pet Travel Carrier on Amazon!